HI my name is Shorty! I am a green cheeked conure. I am a fun and energetic lil guy! I love to move around from place to place. I am not much into that kissing stuff, but I love to do tricks! I will lay on my back in your hand and hang upside down from just about anywhere. I like to climb around on the computer desk and see what good things I can find to play with. One of my favorite places is a shoulder and earrings! They say conures are supposed to be loud but I am very quiet compared to my larger bird siblings. My best bud is a lovebird her name is Rudy. We get into lots of stuff together below is a picture of us trying to see what trouble we can find! ON THE BACK OF MOMS COMPUTER CHAIR! 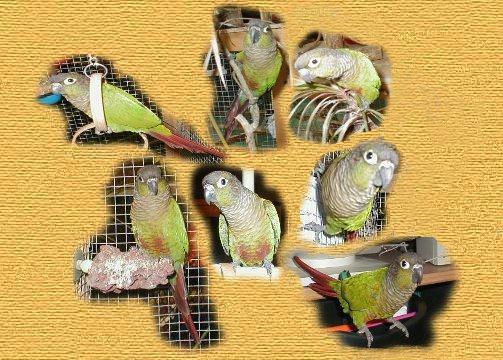 TO LEARN MORE ABOUT CONURES !